Making your own Las Vegas Wedding Invitations? If you are the type of bride who likes a bit of a walk on the wild side a destination Vegas wedding will be perfect! But how to pull it of with a touch of elegance? 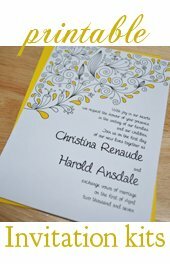 I want to share with you my ideas for some beautiful handmade Las Vegas wedding invitations. From quick and easy to elegant DIY couture - you can create you own one of a kind invitation to match your wedding theme. Of course, the first thing I think of when I think of Las Vegas is gambling! Poker chips and poker cards galore! You can design a beautiful invite based around hearts and spades, kings and queens, or combinations of red, black and white. The Mulberry paper I used for this project was purchased from an arts and crafts store as scrapbooking paper. These kinds of papers are often sold at arts and crafts supplies like Michael's Crafts and A.C. Moore. You can buy them by the sheet. I always wait until they are on sale to buy them in bulk. Always look for a printable coupon! You can save up to 50% off of your purchase! You can also get these papers online through Amazon Mulberry Paper and similar online outlets, but they will be in different sizes than those I used for this particular project. The paper was purchased as size 12" by 12" so I used the sizing to my advantage and created two invitations per sheet by making 6" by 6" invitations. I started by cutting the paper in half. After I cut the paper in half, I turned the outer edges of the paper into deckled edges. I did this by holding a ruler down on the edge (about 1/4" in from the edge) and wet the place in which i would tear with a Q-tip. After slightly wetting the paper I then teared the edge off carefully, leaving a deckle rough edge behind. Next I folded the edges of the Las Vegas wedding invitations in towards the center. This part is actually pretty easy. You can fold them into place with your hands or even score the paper and fold them. I like to fold them a bit by hand and then smooth over the fold with a bone folder. You can also use a centering ruler to mark where the exact center of the paper is for use in knowing where to score and fold your paper. 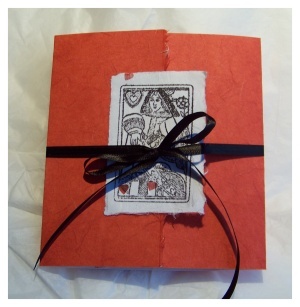 I made the playing card decoration on the front of the invitations using the same mulberry paper and a rubber stamp. This particular rubber stamp is by Inkadinkadoo. They have a number of playing card stamps and other decorative stamps. To make the paper rectangles to stamp the image on I drew a grid onto the back of the mulberry paper using a ruler and pencil. I made the rectangles sized at 2 1/4" by 3". Using the ruler and pencil guidelines I tore each and every rectangle out of the paper by hand. If you'd rather not go with the rough decks edge look, just cut the rectangles using a paper cutter. When stamping the image onto the card make sure and use a really good stamping ink. Cheap ink will not achieve a good result! After stamping the image onto the rectangle attach it to the front of the card. You will want to make sure and attach it by only one edge so that you can still open the card at the folds. I applied a strip of adhesive down the left edge and attached it by this edge only. The best way to get the wedding wording onto the inside of these Las Vegas wedding invitations is to print onto another paper and then attach this paper to the inside of the card. Handmade and mulberry papers are not suitable for printing onto. 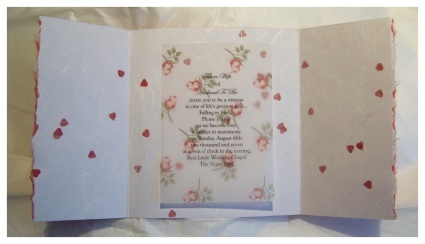 When adding the wording to the invites I chose to print onto a decorative vellum. I printed the text onto 8 1/2" by 11" vellum (four to a page) to conserve paper, cut time and ink costs. If your printer can handle small sheets of paper it will probably be easier for you to cut the paper to the correct size before printing. After printing the sheets of wording I then only cut the paper into quarters. I trimmed the edges down and attached the paper to the inside of the invites using a glue runner. * Need help with this step? Check out the custom printable invitations text page and order a printable 4-up text file. The last step to creating these Las Vegas wedding invitations is to simply add the ribbon to the outside of the card. I cut a nice long length of medium width satin ribbon and simply tied it into a bow around the invitation. I snipped off the edges at the angle on the ends to make them even and finished looking. Add your own pockets to the inside of the flaps for a DIY pocket invitation! Use paper punches with a heart or spade shape to create your own "playing card" style invitation. Fonts That Scream "Las Vegas Wedding Invitations"